Tending to be a more visual type of person, I’m always trying to imagine what the characters in a book look like… with their scenes unfolding like a movie in my mind. It helps to visualize; helps me connect to the story and the characters. So of course, when I’m reading, I know roughly what these imaginary people look like. But do you ever wonder what the author intended them to look like? Does it ever surprise you when your imaginings are way off base compared to what the author’s thinking? Does ever it change how you view the character? So who does author J.A. Redmerski imagine being cast as her characters in The Mayfair Moon? 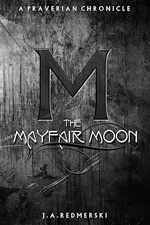 I admit that while writing THE MAYFAIR MOON, I never had anyone in particular in mind for any of the characters, but later I did start to think about who might resemble the characters the best. It was difficult to place them, but I think those that I chose come really close! Michelle Trachtenberg comes closest to casting Adria Dawson, hands down. She’s beautiful and plain at the same time, complete with Adria’s dark hair, freckles (though her tons of freckles are covered by make-up in this picture) and pale skin. 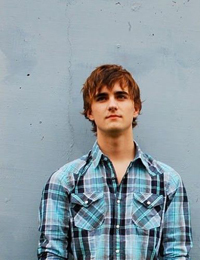 Harry I think can best be compared to Landon Liboiron. Grow out his hair a tad and give him a skateboard and he’s pretty spot-on! Landon actually played a werewolf in a movie called The Howling: Reborn (and he did a great job! ), so hey, he’s already in the werewolf club! I thought Zia would be the most difficult to place, but I found Jessica Stam to fit her character really well. Just give her a short, spiky hairdo and dress her sort of like a rocker chick and Jessica could easily pull Zia’s character off (appearance-wise, anyway). Lastly, Isaac Mayfair was the one character I had the toughest time figuring out. 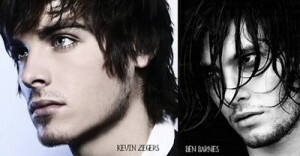 Ultimately, I chose Kevin Zegers, but with Ben Barnes’ hair. Also, Ben Barnes (in this photo) has that ‘primal’ look, which fits Isaac more. But wow those eyes of Kevin Zegers! J.A. Redmerski is the author of the YA Paranormal Romance THE MAYFAIR MOON. It is her debut novel and the first in the DARKWOODS TRILOGY. Jessica is currently working on the second book in the trilogy, titled KINDRED. She is also author of an adult novel titled DIRTY EDEN, recently published. After a nightmarish encounter with a werewolf, seventeen-year-old Adria Dawson loses her sister, but gains the love of a mysterious young man and his legendary family. Strange and tragic things begin to happen in the small town of Hallowell, Maine: residents come down with an unexplainable ‘illness’ and some disappear. In the midst of everything, Isaac Mayfair is adamant about keeping Adria safe, even from her sister whom he has warned her to stay away from. As unspeakable secrets unfold all around Adria, impossible choices become hers to bear. Ultimately, no matter what path she takes, her life and the lives of those she loves will be in peril. As she learns about the werewolf world she also learns why her place in it will change the destinies of many. Love dream casts! They also scare me, because sometimes a choice is sooo far off from my own vision and, after seeing the “official” face, I can no longer go back to my imainging *laughs* But I still love them, and while I haven’t read the book, I liked the set. DUDE!!! This books sounds SUPER freaking awesome! Why have I not heard of it until now?? What a great cast of characters! As interesting as these characters look, I’d love to read about them.